If you are looking for home and office removal services, you have come to the right place. Moving Service is a removals company with many years of experience in safe and secure removals in the Chadwell Heath, RM6. Our team of removal experts is among the most experienced in moving companies in whole of London and pride ourselves in the quality of work and prices we offer, both of which are very hard to compete with. We understand that your possessions are precious to you and this is why we employ only reliable and trained professionals, good quality packing materials and latest moving equipments during our moving processes. We specialize in house and office removals and provide a range of services, depending on what you need. Our quality of personal service, professional care and technical care is unparalleled when it comes to moving services in Chadwell Heath, and they are all available for extremely competitive prices. So call our office today at 020 8746 4402 for a price quote! Located at the boundary of the London Boroughs of Barking and Dagenham and Redbridge, the area covers the postcode district of RM6 and is located 12 miles northeast of Charing Cross. This small hamlet lies along the road from London to Colchester and is now a suburban area of East London. Transport links here include buses and trains. The National Rail service from Chadwell Heath railway station has been upgraded and provides rail access to Liverpool Street, while several buses run from Stratford station, Romford station and Grange Hill station. Most residential properties consist of the terraced houses and villas built at the turn of the last century, but recent development has installed some purpose built apartment blocks. If you are moving to Chadwell Heath, RM6 and need a removal service, you should consider Moving Service located in your area. 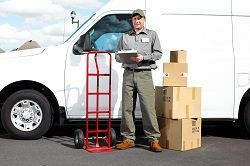 All our customers are special to us, so no matter whether you want a no-obligation consultation or to simply hire a man and a van or to make use of our entire removals package, we will offer you your personal team that will assist you through every step of the process between door-to-door delivery. Our moving crew is knowledgeably trained in packaging and handling fragile and heavy items of all kinds, and uses a range of the best packaging material and equipments suitable for the purpose. If you choose to do the packing yourself and simply want to hire transport, we also offer services to assess the property that needs to be moved and assist you in determining the removal van size and the number of members in the moving crew you would require for it. We have a range of vehicles equipped with lifts and ramps that could be used for lifting heavy goods. Besides providing you services for packing and unpacking, loading and unloading, man and van hire, transport, we also provide insurance to protect your goods against any damage during transit. Moreover, all our vehicles are constantly monitored and our drivers and moving crew members are adequately trained in handling crisis during transport. Using our removals services in Chadwell Heath, RM6 you can always be assured that your belongings are handled with great care and attention. Our past customers have reported extreme satisfaction on having used our services and we are sure that you will enjoy the same experience. So give us a call on 020 8746 4402 and let us show you how we can best help you move. Moving Service is a highly respectable removal firm located in RM6. I've used them to move my aunt's belongings to her new flat after her husband passed. The movers were polite and courteous, which made a difference, as my aunt was quite nervous moving to a new place. Very good communication as well as affordable.